A delicious alternative to the traditional carb heavy appetizer with all of our favorite toppings! Scoop out the pulp, leaving a thin shell (save pulp for another use). Place potato shells on an ungreased baking sheet. Ingredients to put on skins (3 medium-sized potatoes) I got ORGANIC medium ones from Trader Joes. Non-organic is filled with chemicals and pesticides and NOT good for you. Begin by preheating your oven to 375 F.
On a non-stick silicon baking mat (or cooking sprayed cookie sheet), drop three separate piles of cheddar cheese evenly spaced apart. You want to make sure they’re somewhat formed into small piles. Top the cheddar piles with 1 tablespoon each of the real bacon bits. Place in oven for roughly 10 minutes or until the edges are golden brown. Remove from oven and let cool until hardened (about 10 minutes). Top each crisp with a tablespoon of sour cream and a sprinkling of green onion. 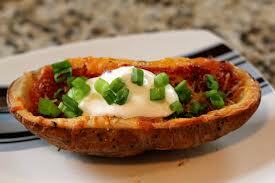 NET CARBS: small potato skin: 11g net carbs, medium potato skin 13g net carbs, and a large potato skin is 22g net carbs.